This year’s Oscars have already proven to be the focal point of many conversations, just hours after the star-studded ceremony ended. Olivia Colman’s emotional speech after winning Best Actress is definitely up there as one to remember, as is Lady Gaga’s and Bradley Cooper’s perfectly executed performance of Shallow, and Melissa McCarthy’s dress-up as Queen Anne from The Favourite – toy rabbits and all. And then, of course, there’s the stage – which many have said resemble something other than inclusion, which is what the production designer apparently intended it to represent. So what was it about the stage which got people talking? Was it the 1,250 Swarovski crystal strands which were dotted around the sparkling blue and gold stage? Nope, although I bet that’s what the designer wishes it was. Instead, it’s the uncanny resemblance to Donald Trump’s hair (wig) which people can’t seem to unsee – and it’s all anyone can talk about on social media. 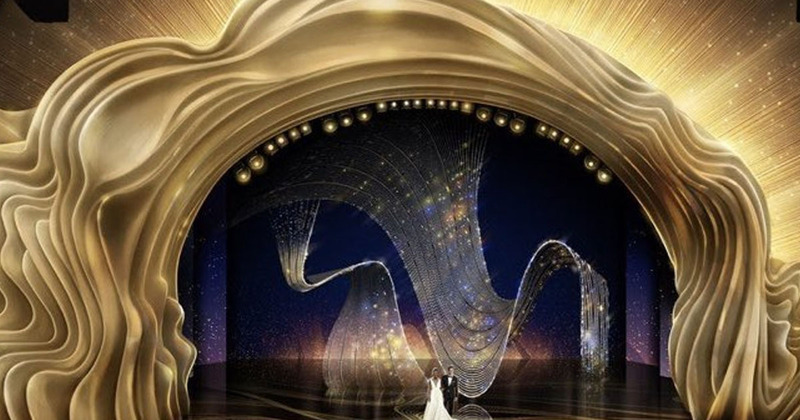 Wait, is the Oscar stage designed to look like Trump’s hair ? The award for best actor goes to Donald Trump’s Hair for it’s spectacular work as the Stage Facade. Oh. Interesting. I don’t see that, but I think that people see in artistic endeavors all sorts of things. You look at paintings and sculpture and architecture and people see what they want to see. And I choose to see one of inclusion and humanity, femininity and beauty. I don’t know about you but I’d be pretty gutted if I’d had this massive artistic breakthrough, believing it to represent inclusion and using more than 1,000 Swarovski crystals to build the dream, and all people saw was Trump’s questionable hair. I mean, c’mon. It’s not exactly ideal. The world is filled with hard lines and straight lines and us-and-thems, and I really wanted people to feel like this was an asymmetrical, warm, undulating art installation that was installed in this theater. The rest of the stage was dominated by more than 40,000 real roses, with Korins saying he wanted to use a ‘perfectly imperfect object’ to be representative of Hollywood’s biggest night. Those red flower #Oscar statues on stage are what’s left of Melania’s White House Christmas trees, yes? Yikes. That’s pretty harsh criticism from, well, everybody.